This one goes in the books at my first and only POST-APPENDICITIS SHOOT. Yep! That's right. Four days before our scheduled shoot I got a text from Jill, "Sooo Jared is going into surgery soon with appendicitis. I just wanted you to know in case he isn't feeling well enough to do pics Saturday. I think he will but just wanted you to know!" And sure enough, four days later he was up trekking through the snowy mountains to get these pictures! You would never know it when you look through and see all their smiles. Thanks for being a trooper, Jared! And just a HEADS UP that I've got one last Utah trip coming up! Contact me ASAP if you would like an anniversary session in Utah because this will be my last trip out there for the year! At the end of the movie, the Von Trapps are hiking across the Alps to Switzerland in adorable parkas and felt hats. I refuse to acknowledge the fact that the actual Von Trapp family simply took a train.. to Italy. That scene never actually happened - but I don't want to hear it!! Plz, let me believe they crossed the Alps, sang more songs together, and settled in a cute Swiss cottage in the mountains. Maybe like... this place? I have LOVED this locations for many years but never had a client interested in shooting there. I suggested it whenever I felt it "fit" with the couple and they didn't already have a specific location style in mind. Yes, I can see how the Swiss inspired architecture, the green window boxes and shutters, wood paneling, painted details and pines around might not be everybody's cup of tea but it is 1000% MY cup of tea and I don't even like tea. So you know what I did? Totally honest? I reached out to Kayley and said, "Hey! You wanna join me for pictures? We can call them.. six month anniversary pictures." It's kinda fun, right? Maybe your engagement pictures were with fall foliage and your wedding had spring blossoms - so wouldn't it be fun to shoot in a different season just for a change? Here's the takeaway. If I only ever shot when I got paid to do so, I'd be missing out on some of the most fun, adventurous, creative, no-fear-of-failing shoots that I've had! Shooting for me has just as much value as the dollar. Especially in any location that I can correlate to one of my all time favorite movies. I get asked all the time, "This is bad time of year to shoot, right? It's not very pretty?" and I want to tell you three ways we can WORK THE UGLY TIMES to make good pictures. The ugly times? I mean winter. Roughly November through April (depending on your coordinates!) when you might get a magical winter wonderland, but more likely will get a mix of snow, mud, bare trees, colorless landscapes, and unpleasant temperatures. Not as magical! I believe with an open mind and the right locations, you'll love it. I visited THREE LOCATIONS this winter to show you what the ugly times can offer you. These pictures were only taken two days apart, all within an hour drive of my local Minneapolis location, but the principals are relevant for all chilly places. ONE. GO FOR WIDE OPEN SPACES. 1. GO FOR WIDE OPEN SPACES. The Dixie Chicks knew it and so do I. Wide open spaces put the ugly stuff (sad, bare, brown trees) far off in the distance. There's some bare trees in the top right of the above photo, but the camera blur hides them from view. Golden fields are seriously MAGIC - is that summer? Spring? Fall? Certainly not... winter..? But it is! Wide open spaces are also enchanting when covered in snow - it practically feels an outdoor "studio" because there is so much clean, bright, whiteness all around. TIP My favorite thing is bringing some of the dried grasses into the foreground of the pictures for close ups. If the grass isn't tall enough, you can achieve this look (photo below) by kneeling down low. 2. EVERGREENS FOREVER! Oh, have I mentioned before how much I love pine trees? Forgive me, but let me say it again. Pine trees (evergreen trees in general) are LIFE. They smell amazing and LOOK amazing all year round. 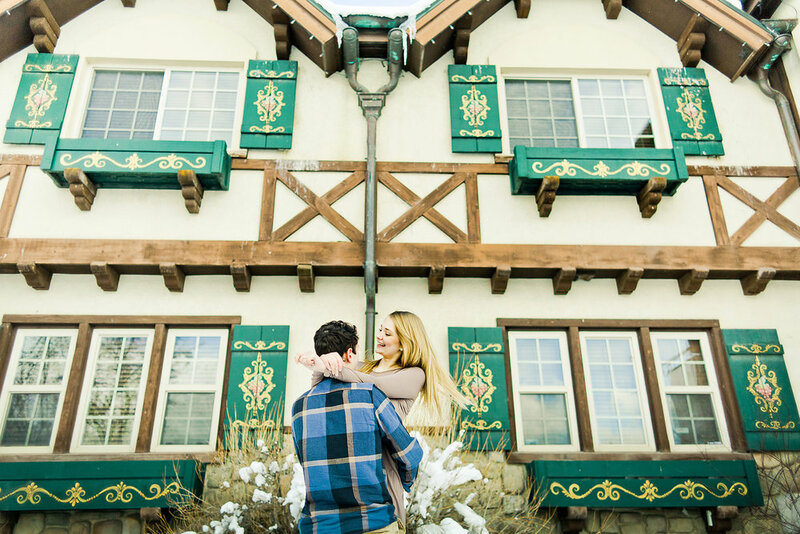 They are the epitome of coziness, mountains, log cabins, and the magic of Christmas and winter. Pines are the go-to for adding greenery in the ugly times of winter - on a sunny day (like above) it can look as fresh as summer. With a little clouds and a few snowflakes, it's as pretty as a Christmas card. TIP For vast forests like these (like above and below) you may need to walk or hike a bit. Luckily, many local parks will have a handful of evergreen trees as part of their landscaping. In the link below, it was just a handful of pines behind a playground. You'd never know! 3. EMBRACE THE DEAD. I tried to think of a more lovely, poetic, way to say that but that's all I got. 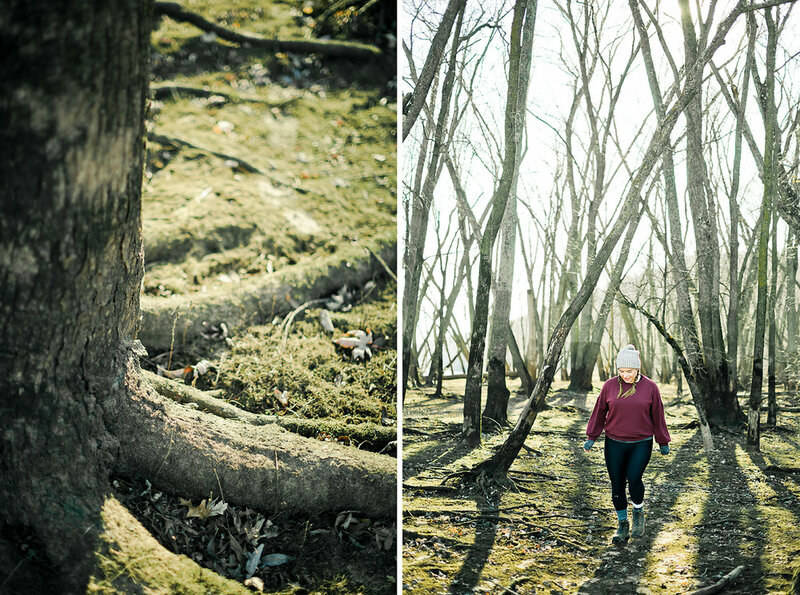 Straight up EMBRACE those bare trees and dead leaves. You don't need to hide the fact that you're taking pictures in early March if you're celebrating your anniversary in early March! That's your season! I hiked along a river and found this woodsy corner - you can tell that in the summer time the river rises and floods straight through all these trees. In any other season, this location wouldn't even be here. That's freaking cool. You can have pictures that no one else will. TIP Personally, if I'm going to do anniversary pictures in a scenery that embraces the dead, I'm choosing BRIGHT colors. Let yourself pop and shine instead of the landscape! I think a red dress would look so amazing against the bare trees. Ok that does make me think a tinyyyy bit about The Village but I'm going to try to ignore that. 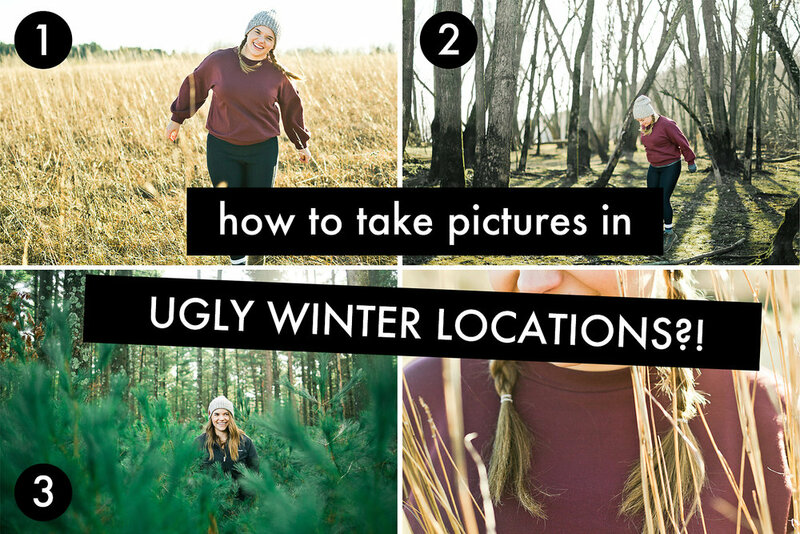 I hope this was a helpful glimpse into embracing winter photography, even when you don't have a Pinterest perfect winter wonderland at your fingertips. Personally, I love shooting through the winter. Locations are less busy because there are fewer people out. 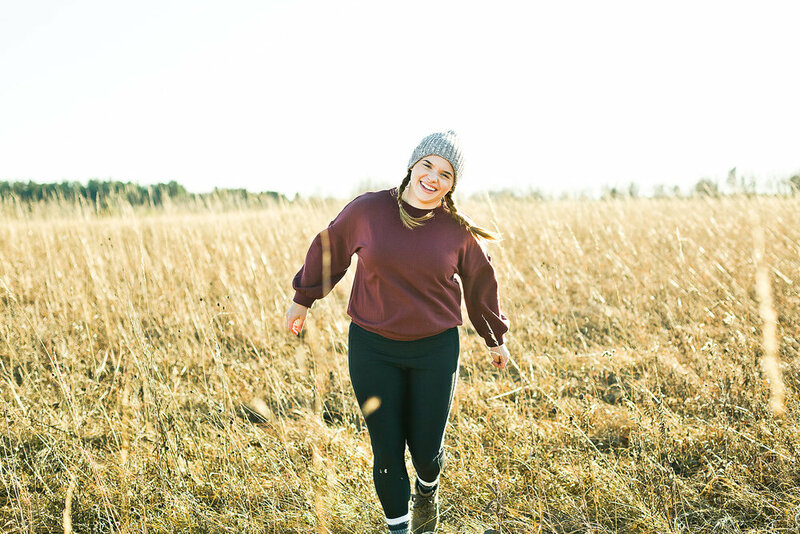 You can add cute hats and knit mittens to your shoot, which is freaking adorable. With a later sunrise time, you can easily start a winter shoot at 9 AM and have gorgeous light (in the summer, it would be like 7 AM!). So, which would you choose?